The fuel cell range-extended electric vehicle is a stop-gap solution until such time that long-range electric cars can speed up recharging and/or a proper hydrogen refuelling network is built, Magna said. Electric cars take time to recharge and hydrogen for fuel cell vehicles is still tough to come by. So, Magna International developed what it described as the solution to this zero-emission conundrum: combine them both in one vehicle. 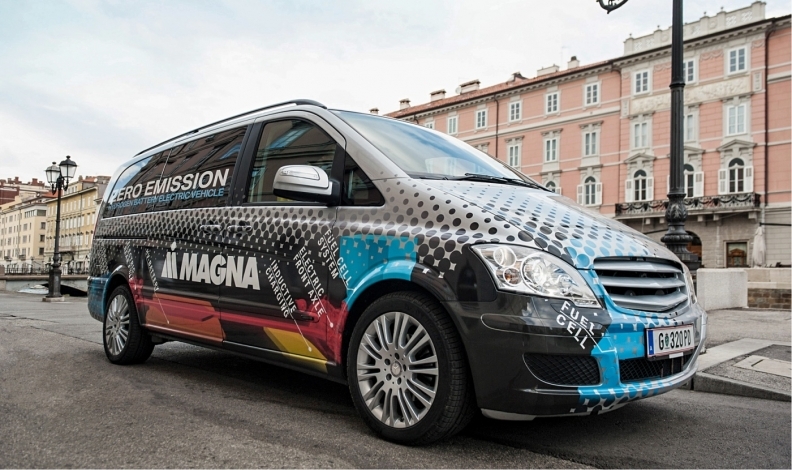 The fuel cell range-extended electric vehicle (FCREEV) concept, built by subsidiary Magna Steyr in Austria, is a debadged Mercedes Viano minivan packing a smaller-than-average fuel cell to recharge its battery on the move. The solution is a stop-gap until such time that long-range electric cars can speed up recharging and/or a proper hydrogen refuelling network is built, Magna said. “There’s a big potential for this type of vehicle in the near future,” project leader Helfried Mueller, head of alternative propulsion systems in Magna’s Austrian r&d, told Automotive News Europe on the sidelines of the Geneva auto show. One potential customer for the vehicle could be urban delivery companies, forced in the future to use zero emission vehicles, but lacking time to recharge batteries. Its range is 350 km (217 miles), about 70 km of which can be on battery power alone, Magna said. The fuel cell stack is rated at 30 kWh, compared to 114 kWh in the Toyota Mirai fuel cell vehicle. Because the FCREEV’s fuel cell stack is smaller and because it works as a battery recharger rather than a primary power source, it’s cheaper than a standard stack. It’s still too expensive however. Mueller estimates even if Magna scaled up production to 500,000, it would still cost 20-30 per cent more than an equivalent diesel engine. The cost of the 16 kWh lithium ion battery pack is on top of that. Magna has no plans for production but instead is using the FCREEV as a mobile shop front for its skills, including product engineering, producing elements of the electric drivetrain and contract manufacturing. The fuel cell stack itself is made by Proton Motor.